With the modern technology we have such as telecommunications, entertainment and home -living comfort and leisure are just one click away. It will vary on what brand will you trust in getting that service you need depending on your lifestyle. Imagine life without the comfort of not having a working or owning a refrigerator with stocked frozen food, cold drinks and even block of butter to use as a spread? Me and my kids are experiencing that right now, I cannot cook right! Last March 2014 exactly 19 months from today, we purchase this Samsung 2-door refrigerator after scouting different brands in market. Abenson's Harbor Point gave us the best deal that time. 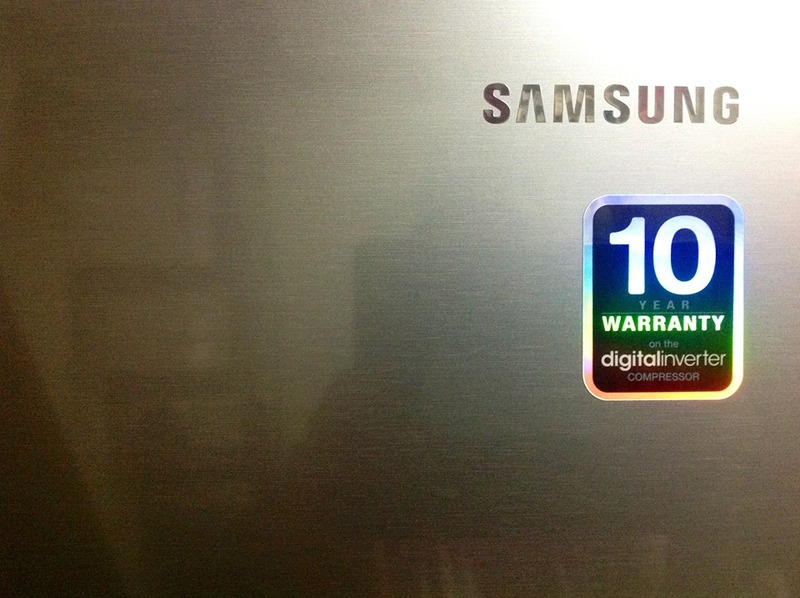 Also, the design was sleek and modern and from my thinking that this brand Samsung can last years and years of service. But I was very WRONG! Btw, my first fridge lasted 9 years with no defect and it was sold as used but in good condition. 10-year warranty on the digitalinverter compressor"
Last October 3, I did my regular market day every weekend and stocked up food in the fridge. The usual frozen food to fresh food items, vegetables and milk plus some dairy products that will be consume for the rest of the week. Excluding some cooking ingredients I have inside. The next morning Sunday October 4, I noticed the freezer temperature is not that cool than the usual cooling temp. And some of my frozen items starting to melt. I thought maybe it's the weather. Until the late afternoon which the cold temperature got lessen even more. We informed the store (Abenson's Harbor Point) where we bought the ref they demanded for the receipt of purchase for the warranty. At first they were hesitant to credit us the warranty told that it was only for a year... meaning it lapsed already. A Samsung rep in that store acknowledged the two-year warranty. Literally, I only have 5 months left to avail the said warranty. October 7, two days after the unit was reported in Abenson's, a couple of repair men from New Dans Olongapo (Samsung branch repair service) came to our house to check on the fridge, with a note on their job order stated : Physical condition- Freezer not cooling, Findings: With LEAK UNIT SCITED FOR PULL-OUT. Contacted New Dans the next day telling us that the defective part was ordered in Manila but they were informed that the part they needed is not available. So we were given an option for repair or for replacement. So the waiting game started here. October 14, Joyce of New Dans requested for a photo as an email attachment of the serial number sticker on the side of the unit. I provided the photo after office hours when I got home and texted her to kindly speed up the process. October 15, 5pm. I called New Dans again and asked for an update. Joyce told me that the email was forwarded to Samsung Head Office and they are the one who will call me and their decision is up to them. Will it be a replacement of unit or a refund. I asked for the refund condition. Joyce told me that she thinks that if in case the refund condition will be applied it will be less the amount the unit has been used. This is NOT acceptable on my part. (Parang luging-lugi naman ako nun!). I asked Joyce on where can I reach Samsung Head Office and she instructed me to look for the toll-free number in the job order form copy we have. I called the hotline and talked to the customer service, with a limited information she can give me she assured me that a personnel from Samsung will call me within 3-5 working days. October 16, mid-day. A call from Samsung HO called asking us to decide if we want to refund or to replace. I don't want a replacement anymore because I don't trust the brand up to this date, I want a refund but they cannot answer the refund process which was I asking. I want to get the FULL amount for refund. October 16 lunch time, Mr.Roman of Abenson's was asking us why we contacted Samsung HO first (as if they were blaming us for that action we made) I told him that I was referred to Samsung HO because Joyce told me that I can make a follow-up there. Mr.Roman was telling me that their store will decide and they have a unit exactly the one we purchased and they can replace it. He will contact New Dans to facilitate the replacement. October 17, Saturday morning. A call from Samsung HO by the name of Mr.Jojo was received. Now, informing me that the defective part is now available and unit is for repair. I told him how inconvenient the situation for me right now and the after sales customer service is so POOR. October 18 no call from Samsung HO. October 19 I called up New Dans spoke with Joyce , informing me the part will arrive today or Wednesday. I am the one who keeps on asking for update which irritates me even more. Up to this very minute WE DON'T HAVE A WORKING REFRIGERATOR! 17 days now and still nothing, We are caught in the middle with no options and the warranty service is running down. If you were in my shoes will you buy this brand? October 20 The unit was pulled-out by technicians from New Dans. I requested for them to take care of the unit specially it does not have any scratches. From my conversation with Joyce of New Dans it will take anothe 3-4 days to repair and check if the system will work properly. 18 DAYS OF NO REFRIGERATOR AT HOME. October 21, 5pm. The unit was returned to us after replacement of the whole system including the compressor and everything else. I hope with all the replacement and the hassle that it gave us and to me personally the motor will last for years with no problem. Still I am not satisfied by this brand, If only we were given a refund of the whole amount of purchase I will accept that and buy another fridge with another brand. Yena's Kitchen, The Newest Kitchen In Town! It's the SM 3-Day SALE at SM City Olongapo!